– and it’s not necessarily a bad thing. In fact, a relationship with frequent conflict may be healthier than one with no observable conflict. Conflicts occur at all levels of interaction – at work, among friends, within families, and between relationship partners. When conflict occurs, the relationship may be weakened or strengthened. Conflict is a critical event in the course of a relationship. 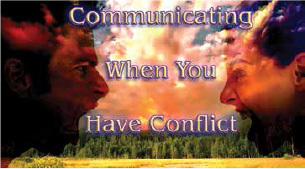 Conflict can cause resentment, hostility and perhaps the ending of the relationship. If it is handled well, however, conflict can be productive – leading to deeper understanding, mutual respect and closeness. Whether a relationship is healthy or unhealthy depends not so much on the number of conflicts between participants, but on how the conflicts are resolved. Sometimes people shy away from conflict, and the reasons for this are numerous. They may, for example, feel that their underlying anger may go out of control if they open the door to conflict. Thus, they may see conflict as an all-or-nothing situation (either they avoid it altogether or they end up in an all-out combative mode, regardless of the real severity of the conflict). Or they may find it difficult to face conflict because they feel inadequate in general or in the particular relationship. They may have difficulty in positively asserting their views and feelings. Children who grow up surrounded by destructive conflict may, as adults, determine never to participate in discord. They may be conflict-averse. In this situation, the person may never have learned that there are effective, adaptive ways to communicate in the face of conflict. People adopt a number of different styles in facing conflict. First, it is very common to see a person avoid or deny the existence of conflict. Unfortunately, in this case, the conflict often lingers in the background during interaction between the participants and creates the potential for further tension and even more conflict. A second response style is that of one person getting mad and blaming the other person. This occurs when a person mistakenly equates conflict with anger. This stance does nothing to resolve the conflict and in fact only serves to increase the degree of friction between the two participants by amplifying defensiveness. A third way that some people use to resolve conflict is by using power and influence to win at the other’s expense. They welcome conflict because it allows their competitive impulses to emerge, but they fail to understand that the conflict is not really resolved since the “loser” will continue to harbor resentment. Similarly, some people appear to compromise in resolving the conflict, but they subtly manipulate the other person in the process, and this, again, perpetuates the conflict between the two parties and compromises the trust between them. There are better ways to handle interpersonal conflict. Conflicts run all the way from minor, unimportant differences to disputes which can threaten the future of a relationship. Conflicts with a loved one or a long-term friend are, of course, different from negotiating with someone who does not care about your needs, like a stranger or a salesperson. However, there is an underlying principle that underscores all successful conflict resolution. That is, both parties must view their conflict as a problem to be solved mutually so that both parties have the feeling of winning – or at least finding a solution which is acceptable to both. Each person must participate actively in the resolution and make an effort and commitment to find answers which are as fair as possible to both. This is an easy principle to understand, but it is often difficult to put into practice. We may get so caught up with our own immediate interests that we damage our relationships. If we disregard or minimize the position of the other person, if fear and power are used to win, or if we always have to get our own way, the other person will feel hurt and the relationship may be wounded. Similarly, if we always surrender just to avoid conflict, we give the message to the other person that it is acceptable to act in a self-serving way at our expense and to be insensitive to our needs. Our feeling of self-worth suffers, resentment festers, and we feel poisoned in the relationship. Instead, it is healthier if both parties can remain open, honest, assertive, and respectful of the other position. Mutual trust and respect, as well as a positive, constructive attitude, are fundamental necessities in relationships that matter. Most people have no interest in creating conflict with others. Most of us know enough about human behavior to distinguish between healthy communication and the words or actions that contribute to rocky relationships. It is in our interest to maintain relations which are smooth, flexible, and mutually enhancing. The problem occurs when we fail to use cooperative approaches consistently in our dealing with others. We seldom create conflict intentionally. We do it because we may not be aware of how our own behavior contributes to interpersonal problems. Sometimes we forget, or we are frustrated and annoyed, and sometimes we just have a bad day. At times we feel so exasperated that we focus on our own needs at the expense of others’. And then we find ourselves in conflict. Once you find yourself in a conflicted situation with someone else, it is important to reduce the emotional charge from the situation so that you and the other person can deal with your differences on a rational level in resolving the conflict. Here is a model that may help in resolving interpersonal conflicts. Have a discussion to understand both sides of the problem. The goal at this initial stage is to say what you want and to listen to what the other person wants. Define the things that you both agree on, as well as the ideas that have caused the disagreement. It is important to listen actively to what the other is saying, use “I” statements, and avoid blame. Come Up With Several Possible Solutions. This is the brainstorming phase. Drawing on the points that you both agree on and your shared goals, generate a list of as many ideas as you can for solving the problem, regardless of how feasible they might be. Aim toward quantity of ideas rather than quality during this phase, and let creativity be your guide. problem. It is important for each person to be honest in this phase. The solutions might not be ideal for either person and may involve compromise. Decide on the Best Solution. Select the solution that seems mutually acceptable, even if it is not perfect for either party. As long as it seems fair and there is a mutual commitment to work with the decision, the conflict has a chance for resolution. It is important to agree on the details of what each party must do, who is responsible for implementing various parts of the agreement, and what to do in case the agreement starts to break down. Continue to Evaluate the Solution. Conflict resolutions should be seen as works in progress. Make it a point to ask the other person from time to time how things are going. Something unexpected might have come up or some aspect of the problem may have been overlooked. Your decisions should be seen as open to revision, as long as the revisions are agreed upon mutually. Copyright © 2013 Simmonds Pub.